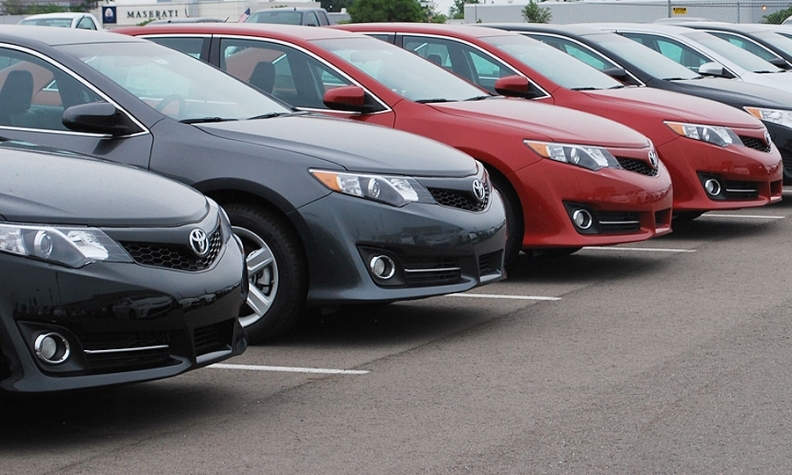 U.S. inventories of the Toyota Camry in June were 15 days ahead of the usual levels, RBC's report said. Toyota's Camry exceeded its seasonal historical average inventory by more than 15 days supply in June and Honda carried about 25 days more Civics than usual, Joseph Spak, a New York-based analyst for RBC, said in today's report. Camry and Civic were the only models identified as at risk for reduced output among 16 of the top-selling vehicles in the U.S. market. General Motors Co., Ford Motor Co. and Chrysler Group LLC all added U.S. market share in the first six months of 2013, the first time that all three gained first-half share in 20 years. Models such as GM's Chevrolet Cruze compact and Ford's Fusion mid-size sedan, leading Detroit's most competitive set of passenger cars in a generation, may need additional production to meet demand, according to RBC. "Toyota is pulling out all stops to sustain its No. 1 market position against a slew of new competition," wrote Spak. "We continue to see downside risk to production schedules for the Civic line as inventories remain well above historical levels." Toyota's Camry inventory was at 55 days supply in June, compared with 57 a year earlier, Carly Schaffner, a spokeswoman for Toyota, said in an e-mail. "Camry has been running at a days supply in the 50s since January," Schaffner said. "Our production is flexible and based on customer demand." Steve Kinkade, a spokesman for Honda, said in an e-mail the company has about a 60-day supply of Civics. Honda has no fleet sales unit and estimates about 98 percent of Civic deliveries are to individual buyers. Civic inventory "is a positive for us in getting dealers vehicles," Kinkade said. Growth by GM, Ford and Chrysler is driving industrywide sales to the highest since 2007, with analysts projecting 15.4 million cars and light trucks sold this year, the average of 18 estimates in a survey by Bloomberg News. Sales of GM's Chevy Cruze jumped 73 percent last month to 32,871, trailing only Toyota's Camry at 35,870 among the top-selling passenger cars for June. "Based on current production schedules and recent demand, it looks like the Chevy Cruze could use a little more stock," Spak wrote. Sales of Ford's Fusion family car slipped 0.5 percent in June, which the company attributed to tight supply. Sales of the car climbed 18 percent in the first six months, and Ford is adding a second shift of 1,200 workers to its Mustang assembly plant in Flat Rock, Mich., to start building Fusions there later this year. "Fusion stock is improving, and will continue to improve as Flat Rock assembly gets up and running," Spak wrote. "We see upside potential to production as Ford would like to get as many of these hot vehicles out." Ford increased its market share by 0.8 percentage points in the first half to 16.5 percent, according to Automotive News Data Center. Market share for Chrysler grew by more than 0.1 point to 11.6 percent. GM boosted its share by less than 0.1 point to almost 18.2 percent.